Wave-driven phenomena are fundamental for the energetics and dynamics of the atmosphere of the Sun. Here we present our discovery of a hot, magnetised plasma ocean of mega-tsunamis in the lower solar atmosphere, which we name Transition Region Quakes (TRQs). The TR is a sharp transition in temperature and density between the relatively cool and dense lower solar chromosphere (2 x 104 K) and the very hot upper corona (1-15 x 106 K). The long-standing enigma of coronal heating may be addressed by firstly understanding the processes which power its lower base, i.e., the TR itself. To understand the wave processes of the solar atmosphere we used a combined approach of advanced numerical modeling and joint satellite observations involving more than one spacecraft simultaneously. Jet-like spicules are the most abundant features in the lower solar atmosphere [1,3,7,8]. Wave-driven (so-called “type-I”) spicules are considered to be important in the processes which heat the TR [4,5,9]. Type-I spicules result from photospheric p-mode (acoustic wave) leakage along magnetic field rooted in the inter-network of convective cells at the solar surface . It has been shown that spicular p– modes (with 5-min oscillations) contain sufficient wave power to travel, as transient plasma jets, through the temperature minimum in the chromosphere [5, 6] and puncture the TR. However, the impact of the spicular wave-train on the TR and subsequent wave energy dissipation has not been understood until now. 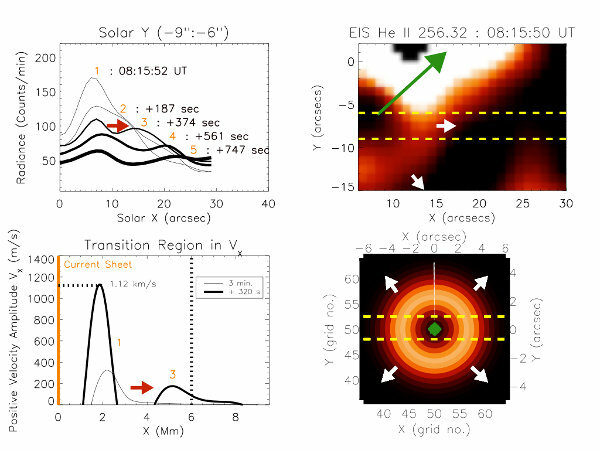 Figure 1: Co-aligned observations of the EIS region of interest, examining multiple layers of the solar atmosphere from the photosphere to the TR and the corona. A ring-like structure appears in He II 304 which propagates away from the location of the jet. We observed a jet at the solar disk centre on 5th March 2007, appearing initially at 18:12 UT. The jet event is detected with EIS (40×512” slot) at lower TR temperatures (He II 256.32) and by STEREO/SECCHI (He II 304 ). Figure 1 reveals the plasma jet formation and projection (red arrow) at the TR in EIS and the response of the atmosphere at different heights above the surface. The EIS shows a ring of emission (solid white circles) at the TR which appears after the rise of the jet. The ring then propagates along the TR (dashed white contour) and away from the jet as a quake-like disturbance. Can we understand the origin of this ring wave via numerical simulations? Figure 2: We simulate the formation of the wave-driven spicule jet (driven by p-modes above the surface) and the subsequent formation of the TRQ at a height of 2000 km. The simulation physical time is 250s which repeats for different viewing angles. The Earth is not to scale. The SAC (Sheffield Advanced Code) MHD simulation (Figure 2) shows the advancing solution of plasma velocity components (yellow iso-surface) in a model (Val IIIc) solar atmosphere. We highlight the p-mode propagation from the lower atmosphere through the solar chromosphere, TR (Z = 2,000 km) and into the corona. Spicular plasma jets which oscillate with 5 min periods are formed, and reach a height of ~8,000 km. Most importantly, we see circular wave structures at the TR which propagate away from the jet location i.e. TRQs. TRQs form as a consequence of upward propelling spicular wave trains that repeatedly puncture and energise the TR. 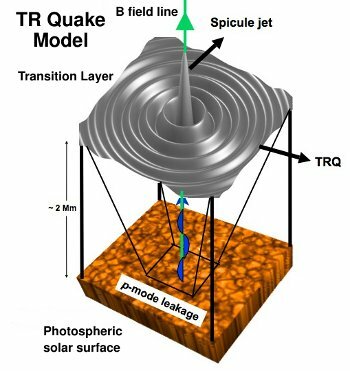 The TRQ is a circular magneto-acoustic surface gravity wave, fanning out radially from where the spicular plasma columns impinge on the TR. The wave is naturally guided by the density and temperature gradient of the TR. We compare the simulations of the TRQ directly with our observations (Figure 3). The TRQ has an amplitude of 500 km. Figure 3: Comparing the observed TRQ wave formation (top row) with the simulated TRQ (bottom row). In the bottom left the evolution of the simulated data cross-cuts (markers 1 to 3) match directly with the observed wave propagation (top right) in time between markers 1 and 3 of wave damping and velocity. The consequences of wave energy damping in the form of mega-tsunamis is significant when one considers the energy balance of the TR. Radiative energy losses at the TR (~ 190 W/m2 ) in the solar atmosphere could be replenished by the wave energy transfer from below, along with emission via explosive events. The maximum TRQ velocity amplitude in Vx (bottom left Fig. 9) is 1.12 km/s. The simulated TRQ amplification and propagation is described through the data cross-cuts (Figure 3) in Vx. With a propagation velocity of 12 km/s the wave energy dumping in a mega tsunami event is 1.2 W/m2. This contribution is relatively small compared with the total radiative losses, however, radiative damping is not included here or the interaction of these waves at the TR which may result a larger energy transfer. Figure 4: Cartoon of TRQ depicting the physical mechanism leading to formation of a mega tsunami at the TR. This process accounts for a widespread, and most importantly, continuous wave energy transfer between the solar interior and exterior. Our discovery of spicule-generated transition region quakes enables us to quantify for the first time  the extent of wave energy transfer into the outer atmosphere of the Sun. The properties of the observed wave propagation and the simulated structures are in very good agreement. The TRQ model presented here (Figure 4) helps us understand how the energy budget of the global TR can be maintained and partially replenished by acoustic wave transmission from the chromosphere, and we believe it is the first model of its type. The TR could be envisaged as a hot, billowing and magnetised plasma ocean of mega-tsunami interactions.